Been a while since the blog has done a post dedicated to the longest running movie series in history. Since I’m attending the re-screening of the most recent film, SPECTRE, over at the Petersen Automobile Museum this evening, we should fix that. 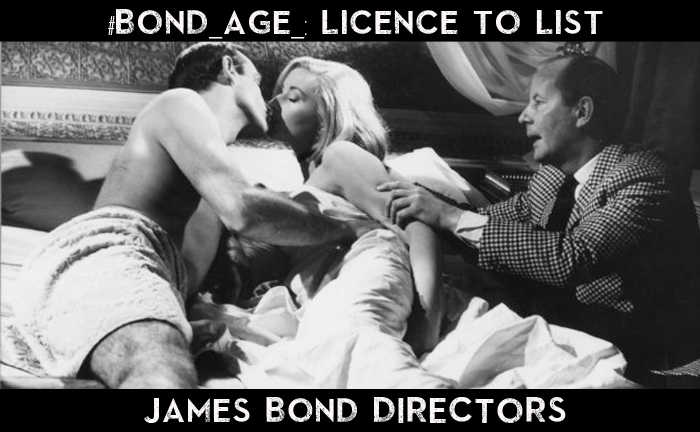 Reblogging what the good folk over at #Bond_age_, The James Bond Media Project, recently did should suffice. The piece by Greg McCambley will do nicely as it ranks all the James Bond directors, and I’m not saying that because we agree wholeheartedly. Granted, I didn’t enjoy SKYFALL as much as most did, but I’d still have Sam Mendes higher2, as would Lewis Gilbert’s contributions. We’ll just leave Lee Tamahori exactly where most Bond fans will place his lone work…right along with that horrid Bond number Madonna left in her wake. Either way, the licence to list article is a thoroughly enjoyable read that should draw a lot of attention, and I recommend to Bond as well as movie fans alike. Very interesting – and I agree with you about the top 5. In fact, I would probably say the only real disagreement is, as you predict, Mendes, who I would put put at 7 after Apted instead of Spottiswoode and move everyone else down a notch as a result. Great reblog Michael! 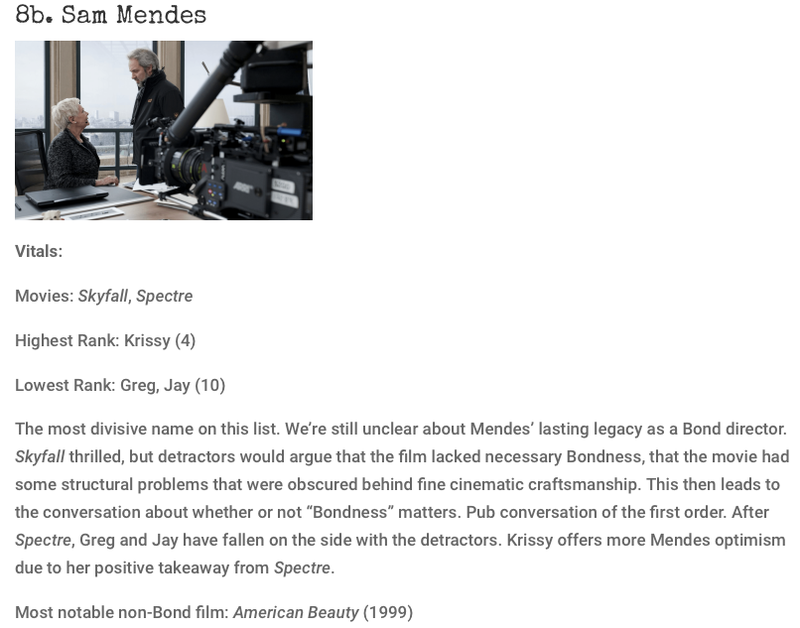 I like Skyfall, it’s Spectre I have lots of issues with but I still think Mendes is one of the best directors of the franchise. I’m still hoping they’d hire Martin Campbell again though, considering how good Casino Royale was. But yes, no more Lee Tamahori! You can’t beat a bit of Bond-age!